The damage caused by Cyclone Debbie could be severe, say scientists. CORAL BLEACHED FOR two consecutive years at Australia’s Great Barrier Reef has “zero prospect” of recovery, scientists warned today, as they confirmed the site has again been hit by warming sea temperatures. Researchers said last month they were detecting another round of mass bleaching this year after a severe event in 2016, and their fears were confirmed after aerial surveys of the entire 2,300-kilometre long bio-diverse reef. It takes at least a decade for a full recovery of even the fastest growing corals, so mass bleaching events 12 months apart offer zero prospect of recovery for reefs that were damaged in 2016. It is the fourth time coral bleaching – where stressed corals expel the algae that live in their tissue and provide them with food – has hit the reef after previous events in 1998 and 2002. The bleaching is caused by record-breaking temperatures driven by global warming. 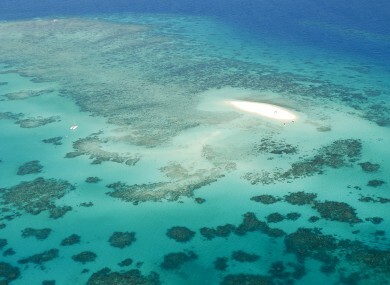 Queensland Parks and Wildlife Service and the Great Barrier Reef Marine Park Authority began a study last week to determine how extensive it might be and have already found extensive pulverised coral at popular snorkelling spots. The Whitsundays is one of the reef’s tourist hotspots, attracting more than 40% of total visitors to the iconic marine ecosystem. The world’s nations agreed in Paris in 2015 to limit average warming to two degrees Celsius over pre-industrial levels, by curbing fossil fuel burning. Canberra in 2015 narrowly avoided UNESCO putting the reef on its endangered list, and has committed more than Aus$2.0 billion to protect it over the next decade. Email “'Zero prospect' of recovery after Great Barrier Reef decimated by the heat and Cyclone Debbie”. Feedback on “'Zero prospect' of recovery after Great Barrier Reef decimated by the heat and Cyclone Debbie”.